Then I saw the above comment from a poster in Facebook on a friend’s page. This seems really bizarre. I certainly have severe objections to censorship of any type, particularly as it relates to communication and government. This is the opposite of transparency. Any democracy-minded person should be alarmed when censorship enters the official discourse, particularly at the highest level of government. Mr. Neuwirth does not seem to be worried about that. In the past year, Trump and ilk have created this new concept of “fake” which has become to engender everything they don’t like, it appears. If they don’t unilaterally approve, it’s “fake.” But the contrary is actually the case. When you censor communications, you are hiding the true meaning and covering it up with obfuscation. Purposefully obfuscating simple concepts so the public can no longer grasp what is really going on is propaganda. We should be weary of propaganda. While the Trump camp now tries to make us believe that all media, foreign and domestic, is “fake news,” except of course Fox News, I suspect the opposite is actually true. When I watch Hannity now I always feel that I am bombarded by propaganda, yet when I read the Washington Post, I feel I am getting clean, succinct and world-class journalism. By definition, half of the population in the United States has an IQ below average. 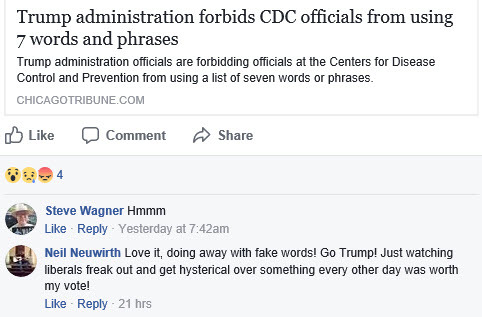 By banning “big words” the government is pandering to those who have not learned to think critically. Making America Dumb Again is in full swing. Those are two of the most memorable phrases from presidential speeches, and they have entered into the very fabric of our nation’s history. President Obama was an excellent orator, and I believe that was one of the major contributors to his meteoric rise. Critics spent years ridiculing him for reading from a teleprompter. I don’t agree. I have personally given many a speech in my life, never with a teleprompter, and never with a deck of cards or sheet of paper. I know a bit about what it takes to give a powerful speech, and I know that Obama is one of the outstanding orators of our time. Yes, he needs a teleprompter because there are not enough hours in the day for him to memorize all these speeches. But it was always obvious to me that he knew what he was talking out. When Obama spoke, he spoke from within, and the teleprompter was there to make sure he didn’t miss his points. It never felt like Obama was reading. President Trump, in contrast, is a completely inadequate speaker. He did not get elected for his oratorical skills. Trump cannot even form a coherent sentence on his own, let alone speak. He spouts trite soundbites, and he repeats them for effect. When Trump speaks from the teleprompter, he sounds wooden, like he is reading his material. Trump is so bad, that the media praise him when he simply reads, in his wooden, stilted way, a speech without going off script. He is so transparent that we know immediately when he is off script, since he sprinkles in Trumpisms like “believe me” or “that I can tell you” which no speech writer would ever insert. Trump does not speak any better than an average fifth-grader even when he reads. One of Michelle Obama’s signature accomplishments was the institution of healthy school lunches around the country. The Trump Administration has just rolled back that initiative. Here is Michelle’s response to that. She argues understandably that she doesn’t understand how somebody can actually say they don’t care if our children eat crap. “Who does that?” she asks. Ok, Tomahawk1775 is pointing out that the school lunches didn’t taste good. But since he can’t make a coherent argument, he tries to make his point by spouting obscenities and insulting Obama. You can say anything about Michelle Obama, but you can’t say she does not have a brain. She has a law degree from Harvard. I wonder what Tomahawk1775’s degree is? Chelsea Roan resorts to a similar strategy, albeit more crass, and more offensive. No actual argument. Just crude personal attacks. But at least she uses her own name and stands behind her assault. She is not hiding behind an anonymous handle. Santacruz474 just makes an observation and interpretation, which appears flawed. I don’t believe that Obama is shallow enough to be just pissed about “her program.” I truly believe Obama is concerned about the future of our country and about the nutrition of our children. Here, CritterOnFire (anonymous) and Amanda Gonzalez (apparent actual name) use deflection because apparently they can’t come up with a logical answer. The deflection on abortion is not only inappropriate in this context, it is illogical and it points out a common fallacy of the so-called pro-life proponents. Pro-life is defined as “opposing abortion and euthanasia.” These two people, and many others in the pro-life circles, are using false logic by labeling the opponents of pro-life, who we call pro-choice, as people who are somehow pro-death. There is, if course, a huge difference. Then inferring that “Democrats are saying ‘abort all the kids, abortion is great'” is an insult to all Democrats. Not all Democrats are pro-choice, not all pro-choice people think abortion is great. As a matter of fact, I know some pro-choice people, of course, and I haven’t met a single one who thinks abortion is great. Finally, there are tons of statements like this. That’s why we came up with the term “deplorable.” I am sorry, Pana Sonic, but your statement is deplorable. Never read the comments below any political YouTube. Our country is polarized and hateful. We write and comment things about each other that we’d never openly say to each other at a backyard BBQ party. Pro-choice is not pro-abortion or pro-death. School lunch programs have serious issues. Since this is about school lunch programs, we should discuss this in more detail. I believe that nobody in the country would argue that we want our kids to eat crap, well almost nobody. We agree with Michelle Obama on that. The problem is that it’s not the school’s job to nourish children. It’s the parents’ job. Researching for just a few minutes lays open that the school lunch programs, as implemented by Obama, were a failure. Not because the lunches were supposed to be healthy, but because the children didn’t eat them. They went into the trash. Administrators and school officials everywhere seem to agree that the trash cans were overflowing with unopened and untouched food. Not only did we waste the money spent on the food, but we ended up not feeding the children. Parents report that they had to pack lunches, since the children complained about the food and went hungry. Clearly, while Obama’s initiative was admirable, the way the program was implemented does not seem to have been successful. I do not know what thought the Trump Administration put into the repeal of the program, but I am sure it wasn’t an initiative to start feeding kids “crap” again. It had something to do with the philosophy that it’s not the job of the public to nourish children. It’s the job of the parents. They wanted to stop spending money on food going into the trash. That leaves us with the dilemma of what to do. Dictating a certain menu to schools nationwide, while it makes sense in concept, didn’t work in practice. Our children eat what they are taught is good at home. That’s what they expect in school. Government is not good at dictating what people eat. That has never worked before, and it’s not going to work in the future. The problem, of course, is that for a significant portion of our children of poor families, the school lunch may be the only solid, sound and reliable meal they get in a day. This, too, is not viewed as a government problem. It’s one of education and it’s one of parents acting responsibly. Unfortunately, this is now a generational problem. We have a generation of children whose parents and grandparents never learned the tenets of proper nutrition, who have been nourished by McDonald’s. How could they pass on good nutritional habits? There is no easy answer to school lunches. Polarizing the issue with hate messages going in both direction is not solving the problem. And the children continue to eat poorly. I know I have readers who are professional educators. I encourage their comments and insight. This is really cringeworthy. DeVos wearing a Masters gown, even though she has only a B.A. degree from Calvin College, a Christian university. She reads her speech off a piece of paper. She is stiff and wooden, and the speech has no substance or inspiration whatsoever, not because the subject of the speech she chose, but because everyone knows she’s a phoney. How did she even get invited? Who thought this was a good idea? DeVos has no place giving a commencement speech, and she proved it here. This is how we are making America great again! 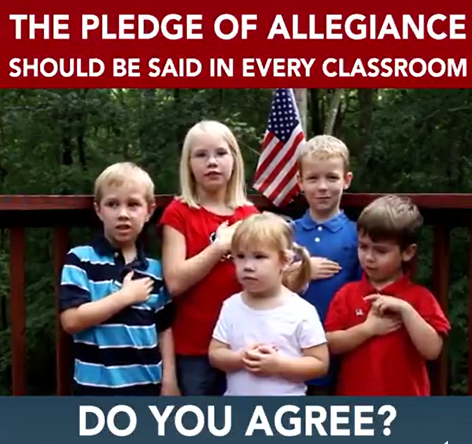 Contrary to what many people think, the Pledge has nothing to do with our founding fathers. It was written in August 1892 by the socialist minister Francis Bellamy (1855-1931). It was originally published in The Youth’s Companion on September 8, 1892. Bellamy had hoped that the pledge would be used by citizens in any country. It didn’t have “the Flag of the United States of America” in it at the time. That was not added until 1923. “Under God” was added during the Eisenhower administration in 1954 to counteract communism. Bellamy’s daughter objected to that change. Making children recite memorized slogans in a public forum, under peer pressure, is a form of brainwashing and propaganda. Just like school prayer. We should give our children the gift of critical thinking. When they know how to think for themselves, they can decide to what and who they should have allegiance for, based on merit, not on memorized slogans, especially if they don’t know the origins of those slogans. Once they are adults, they should have been exposed to a number of political philosophies and different religions, and it should be an easy and obvious choice for them to decide which ones they want to subscribe to. Why is DeVos Good for America? 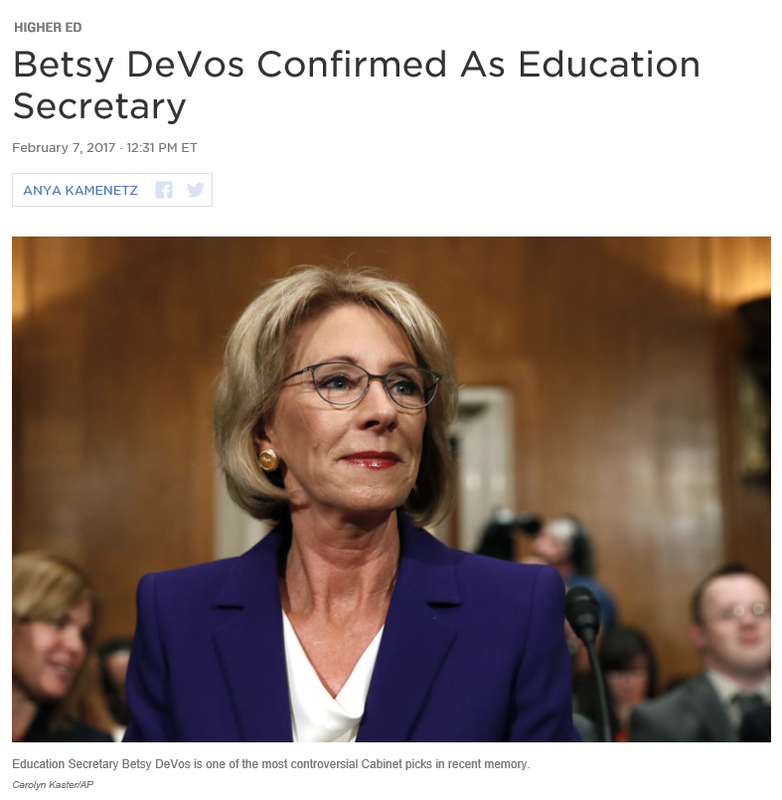 The U.S. Senate just confirmed 51 – 50 the nominee Betsy DeVos for the position of Secretary of Education. DeVos appears to have little knowledge of our educational system. She has never taught, has no education in “education” and is in fact an outspoken critic of the very system and institution she is now assigned to lead and run. I understand that not everything our president does is going to be popular with everyone. But DeVos for this position is just so very wrong. How can 50 senators not recognize that? Are all 50 senators willing to sacrifice the education of an entire generation of children just to gain political favors? Can somebody, please, explain to me why Betsy DeVos should be Secretary of Education? We now have placed the lives and futures of all the country’s teachers and students into the hands of a dimwit religious rich woman under the leadership of a buffoon. The Dumbing Down of America is Well Underway and the Oligarchy is Solidified. We are going to use our taxpayer money for “America to become great again” by systematically dumbing down our children so in future generations they will continue to vote for more trickle-down economics, corporate welfare and tax cuts for billionaires. Anthropogenic global warming is a hoax. Evolution is an evil delusion. Human life begins at conception, except when the life is Muslim, an illegal alien in America, black, or homosexual. 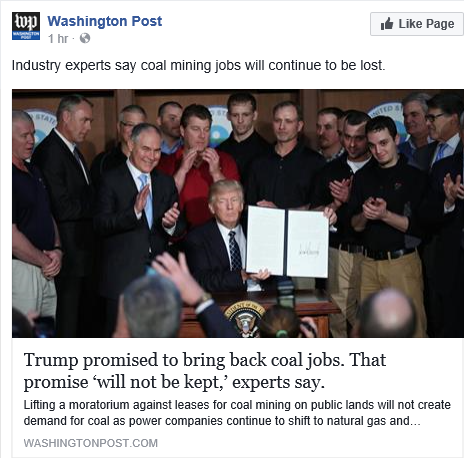 Science is bad unless it’s studying fossil fuel advancement. Ok, enough from my soap box today. Check out this video and PLEASE tell me that this is a parody! Then read down into the YouTube comments below (which I have often warned here never to do) and see how many people support these idiotic statement made in this video. Even if the person posting this video does it as a parody, these people commenting certainly don’t get it. How can there be people in the United States, moving a mouse causing movement of cursor on a computer screen hosted by YouTube, sent to their house via satellite from some data center in Sweden, that do not believe the earth is a sphere? Do these same people use GPS in their cars? I don’t think there is anyone outside of the United States that would buy into such batshit crazy nonsense. Europeans certainly aren’t. They are too busy building BMWs, and particle accelerators, and watches. The Chinese certainly aren’t. They are too busy building EVERYTHING. I was at Home Depot yesterday, buying a replacement rod for blinds (made in China) and a few washers (made in China). Everything at Home Depot is made in China. Everything at WalMart. Everything at Sears. EVERYTHING. It’s because Chinese kids go to school 260 days a year and they’re not wasting time debunking science. The Chinese are busy teaching science. Then there is our friend the dumbing-down-America in chief, Donald Trump. He is going to make America great again. Just trust him. He’s gonna do it. And he’s gonna build a wall, and Mexico is gonna pay for it. Because he’s a business man. He knows how to build great buildings. Go vote for Trump. Make America dumber yet! And then tell me this video is a parody, so I can rest again. As if single mothers were not already victimized enough in our society! Now let’s victimize the children, too! I agree, it should not be the responsibility of the public to take care of the children fathered by irresponsible men and their victimized women. It is not acceptable to father children and then not take responsibility for them. Young women should evaluate whether they can afford children before they have them. Society should not have to pay for the children of deadbeat fathers. But denying them birth certificates is outright bizarre. How exactly does that solve any problem, but create even more hardships for the most exposed and vulnerable people in our society? It is education that solves this problem. Teaching young men a sense of responsibility. Making birth control available to young women. Subsidizing birth control (by funding organizations like Planned Parenthood) is a huge preventative measure and immensely cheaper than welfare for the victims. Family planning should be part of every curriculum in high school. Condoms should be readily available to girls. It’s all about education folks! Here is a Facebook post worth reading. A fascinating look at school lunches in Japan.